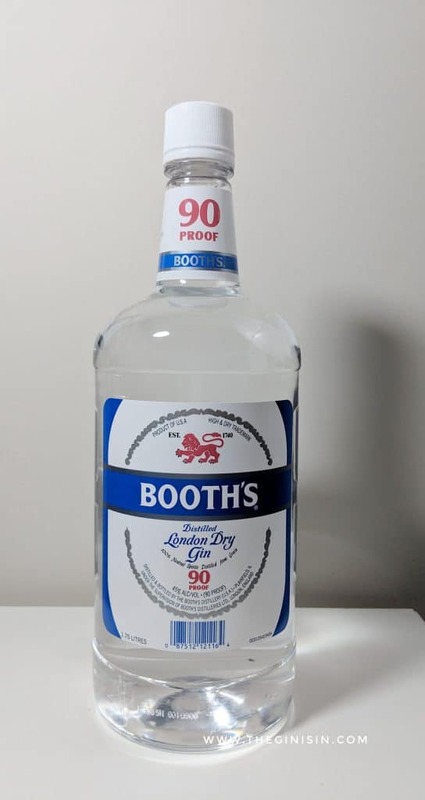 Booth’s Gin was back in the news in late 2018 when the once esteemed brand was unloaded by parent company Diageo. Nineteen brands including Seagram’s and Parrot Bay to name a couple— were sold for over half a billion dollars to Sazerac. Whether fair or not, Booth’s and many of the other brands involved in this sale are not seen as premium products. With sales in the late 2010’s flagging for “lower end” brands, the move makes business sense for Diageo. However, the fall of a brand, who along with Gordon’s are the only two extant gins that can trace their story authoritatively back to the mid-18th century, is unusual in an industry where brands desperately jockey for historicity and early founding dates. Booth’s Gin is distilled in Plainfield, Illinois “under the supervision of Booth’s Distileries Ltd.” Bottled at a robust 90 proof, the modern day gin marks a stark contrast from some of the older offerings under this name (which are still routinely traded on the Vintage spirits market). Booth’s Gin is a by the numbers classic style gin. Juniper dominant on both nose and palate with hints of classic gin botanicals in background notes. It’s heavy with the juniper notes on the nose. Very classic at first nose. Hints of citrus and licorice root hover on the edges. Booth’s Gin is clean and very classic on the palate. Juniper is the predominant note. It has a pine and slightly waxy, herbaceous character to it. The finish is rather dry with hints of the aforementioned licorice root, angelica root, and dry coriander. There’s little here that’s surprising botanically or taste-wise. The entry on the palate is rather smooth, especially for a gin perceived as a “value” product. The warmth at the end never reads as hot or cheap. At its price point, Booth’s Gin is designed to be a work horse mixing gin. And it’s amazing to me that it’s not more common in wells. You see Crystal Palace, Carnaby’s, and other gins getting far more air time. It’s a shame by my opinion, but this classic gin flavor is superior to many other “value” gins. It works well in a Gin and Juice, Gin and Tonic, or standard issue Negroni for that matter. While I think there’s better gins for a Martini (for example), Booth’s Gin isn’t bad in this situation either. Some of its simplicity in presentation and lack of complexity on the finish might not warrant the highest-of-price points, it works well with a simple twist, even here. This is probably the best classic-styled gin you can get in a plastic handle. There’s certainly more inexpensive offerings on the bottom shelf— and if you’re looking to cut corners, you can certainly go lower. But for this category where you’re looking for an under $20 gin— Booth’s Gin is probably one of the best values in gin. It’s not great, but it’s solid. And if you’re a fan of classic-style gin, you’re sure to find that this will satisfy your gin craving. Discovered Booth’s gun while in Fla. and love it. Where can I find it in Michigan? Am in Traverse City.